Trey Gray, a famous drummer, and his friends held a special evening at the Vegetable Buddies establishment in South Bend Indiana http://buddiesdtsb.com/ last October. The band hosted a concert, and because of his notoriety, Trey raised $50,000.00. These dollars are being donated to the nonprofit Trey started in 2015, the Huntington’s Disease Foundation. We Can Never Lose HOPE…. Trey wrote a book jacket comment that appears on the back cover of Watching Their Dance. 100% of the profits are being donated to the nonprofit, Huntington’s Disease Society of America, HDSA. We are getting close to the Sacramento Team Hope Walk. Create your own Team and help the Northern California Chapter fundraise to continue supporting the four (4) Center of Excellences in Northern California, and the seven (7) Huntington’s Disease Support Group Facilitators. We Can Never Lose HOPE……………. Therese has been a member of the HDSA Northern California Chapter Board of Directors since January 2017. She will be president of the Chapter in 2020. John and I are so excited to share the good news. The nonfiction book I published in April, 2017, Watching Their Dance: Three Sisters, a Genetic Disease and Marrying into a Family At Risk for Huntington’s, has generated a profit of $9,015.00 that we donated to Huntington’s Disease Society of America to help in the fight against the cruelest disease on the planet; Huntington’s disease. 100% of the proceeds from Therese’s book is being donated to HD organizations around the world. I’m going to digress just a bit and reminisce about the 2016 NYC Marathon. Vanessa and Fran were on the Huntington’s Disease Society of America (HDSA) Team last year and we were their biggest fans, rooting them on. Keith, Fran, John and I flew to NY together on Thursday and Vanessa, Scott, Jim, Dawn, Scott’s parents arrived Friday. HDSA staff threw a Kickoff party for all the participants and it was a lot of fun. I’m in the picture with Chris Cosentino, Director of Communications and Marketing at the party. He’s my contact at HDSA National for promoting my book, Watching Their Dance. The 2017 HDSA Team, the marathon is Nov. 5, has raised over $132,700.00 surpassing their goal of $100,000.00. This is an awesome fundraiser and HDSA is not the only charity that participates. There are more than 350 Official Charity Partners of the 2017 TCS New York City Marathon. Therese’s memoir/nonfiction book, Watching Their Dance: Three Sisters, a Genetic Disease and Marrying into a Family At Risk for Huntington’s, is available on her author website http://www.theresecrutchermarin.com & on Amazon, B&N, & in Kindle,Kobo, Nook, iBooks format. In the U.S.,100% of the proceeds from the book is being donated to HDSA. Huntington’s Disease Society of America (HDSA) fundraisers are going on all across the United States. Find one near you and support a great cause and help to eradicate the cruelest disease on the planet, Huntington’s disease. 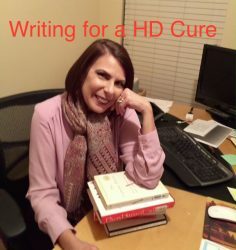 Therese is donating 100% of the proceeds from her nonfiction/memoir book, Watching Their Dance: Three Sisters, a Genetic Disease and Marrying into a Family At Risk for Huntington’s, to HDSA and Huntington’s disease organizations around the world. Last April, I finally held a book in my hand. Publishing Watching Their Dance: Three Sisters, a Genetic Disease and Marrying into a Family At Risk for Huntington’s was a dream come true. My fundraising/HD Awareness Project was now ready to be presented to the world. The second dream I had was taking a book tour to heighten awareness of Huntington’s disease and promote the book. John and I love traveling the highways and back roads, avoiding freeways, taking the time to enjoy the landscape, animals, agriculture in different states, so we traded in our fifth wheel and truck and purchased a 30 ft. motorhome. As John and I began to plan the tour, my job was to plot HDSA events we could attend after the National Convention and John was in charge of mapping out our route. Since we’ve never visited the Midwest, we saw it as an adventure. Therese’s Book Tour will be continued on the next few blogs! Therese is donating 100% of the proceeds from her book to HDSA. When the book is purchased in another country, she will donate the proceeds to a Huntington’s disease organization in that country. Therese’s memoir/nonfiction book is on her author website http://www.theresecrutchermarin.com and on Amazon, B&N, & other book website & as a Kindle, Kobo, Nook, iBooks file. HDSA Fundraising Events in U.S.
John and I are entering the last month of my book tour. The time on the road, two months, has gone so fast; I don’t want it to end! Here’s what we have planned. August 1-Akron Ohio. Attend a local HDSA Support Group to share the purpose of my book. A HDSA social worker facilities a support group for folks with HD and those living at risk. August 8-Sterling City Michigan. Attend the HDSA Support Group meeting and share my book with attendees. Enjoy our trip back home. WooWoo!!!!!! To purchase Therese’s book, please visit her Author Website: http://www.theresecrutchermarin.com 100% of the proceeds from the book is being donated to Huntington’s disease organizations around the world.